I’ve been wanting to write about the cost of adoption for some time now, but it kept feeling a little tacky to discuss. Yet, cost is still an important part of the process because it is expensive. I ran across this chart today and thought it might help break down some of the financial details a little bit. These adoption fees go to the social worker, adoption agency, advertising, attorney, court, and any expenses the birth mother may have. They add up quickly, so you may want to enquire about what pieces you can do yourself to save money. You should also tell your adoption agency your budget. I have heard of friends and families hosting a “baby shower” where everyone contributes money to help fund the cost of an adoption. I have also heard of loans and grants, however I was never successful in finding any. Saving up enough money to pay for an adoption is very difficult, particularly if you’ve just paid for infertility treatments. Hopefully this chart will help you find the best path for your family. If you have it in your heart to adopt, do not let the cost scare you. There are definitely possibilities on the lower end of the price range. 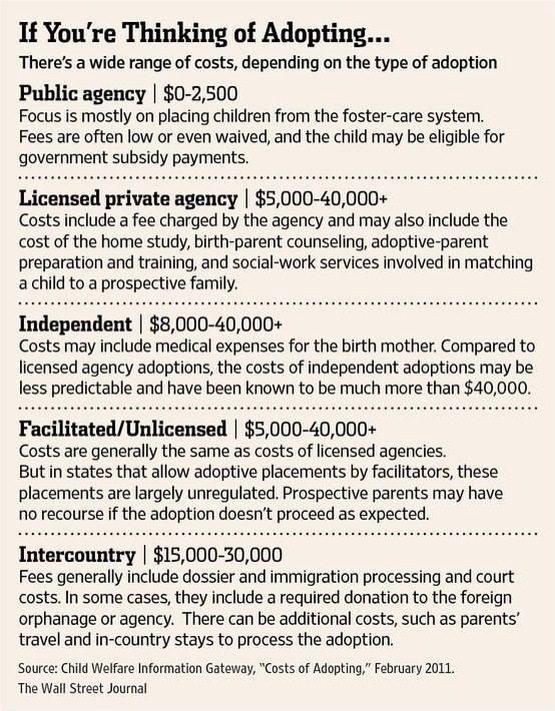 Remember, these fees go to the people facilitating the adoption. They do not pay for your baby so a more expensive adoption does not mean a “better” baby. There is also a refundable tax credit available toward qualified adoption expenses that people may be able to qualify for – it was up to $12,970 last tax year.